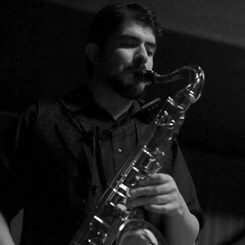 Equally comfortable in multiple genres of music, saxophonist Armando Salas began his interest in music at a young age. While in high school, Armando performed with the prestigious jazz group the Youngsounds of Arizona under the direction of pianist Barb Catlin. Armando received his Bachelor of Music Degree in Jazz Studies from the University of Arizona (UofA). At the UofA, Armando studied saxophone with Dr. Kelland Thomas, Dr. Timothy McAllister and Brian Sacawa. Mr. Salas also had the unique opportunity to study flute with famed flute professor Dr. Brian Luce. His other musical pursuits at the University include studying composition with Daniel Asia, jazz ensembles with Jeff Haskell and Moisés Paiewonsky, and the Pride of Arizona marching and pep bands under the direction of Jay Rees and Kelly Thomas. From his elementary through professional career, Mr. Salas developed a palette of wide musical styles through performance in various ensembles, ranging from concert bands, jazz bands, chamber groups, marching and pep bands. It was through performance in these various ensembles that gave Armando interest in many areas of music, from performance, teaching, composing, and arranging. These varied interests have given Armando the chance to express his musical abilities in multiple fashions. He has premiered multiple original saxophone chamber works and contributed musical scores to up and coming film makers. Armando currently resides in Phoenix, Arizona where he continues to perform and compose with the Jazz Munkeys. Request Lessons with Armando today!